(15/P63) TRENTON – The bounties of New Jersey forests, from forest stewardship and hiking trails to majestic trees and pollinating bees, can be explored in a series of free programs this summer at the Department of Environmental Protection’s Forest Resource Education Center in Jackson. The Center, at 495 Don Connor Boulevard, is offering free family-friendly hikes or guided tours on Thursdays in July and August, and several other special events and programs on select evenings and weekend dates during the remainder of the year. The center, operated by the DEP’s State Forestry Services, is open weekdays to the public and on the second Saturday of each month, except in September. Visitors can learn about forestry in New Jersey as well as the organizations within State Forestry Services, such as the Forest Fire Service, community forestry and more. July 23: Swamp Life. An investigative hike on the Swamp Life trail about forested wetlands. Hikers will look for plants and animals and listen to the sounds of the wild. July 30: Animals of the Forest. A live reptiles program will follow a woodland habitat walk. August 6: Changing Forest. Go on an approximate three-mile walk to learn about the different types of forests at the 875-acre Forest Resource Education Center. August 13: The United States of Trees. An interactive program for all ages will introduce and reinforce the names and locations of U.S. states while identifying tree species and where they grow. August 20: Pollinators. Explore the grounds at the property’s Interpretive Center to learn what plants attract pollinators, the importance of and lifestyles of the pollinators, and tips on how to attract them to your property. August 27: A Day in the Life of a Tree. Explore trails to look closely at common tree species of New Jersey, perform hands-on activities to understand how trees breathe, make their own food, fight off insect pests and what happens when they die. In addition to the Thursday Explorers series, the center is open the second Saturday of each month throughout the year. Similar hikes and guided tours will be offered those days at 1 p.m. The property is open daily from dawn to dusk for passive recreation such as hiking and exploring interpretive trails. The 10th annual Full Moon Hike is scheduled August 28 at 7 p.m. and will feature guided hikes while the sun sets and the moon rises. A popular free series for adults entitled “Backyard Forestry in 90 minutes” is offered the second Thursday of the month at 7 p.m. for landowners and homeowners. The event is co-hosted by the New Jersey Forestry Association and Rutgers Cooperative Extension. Space is limited. 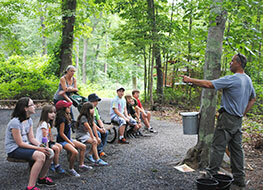 To register for the Backyard Forestry Programs, visit: www.njforestry.org/mybackyard. All programs and parking are free, and held rain or shine. Visitors should dress for the weather, wear sturdy hiking shoes and bring insect repellant. Scouts may attend some events to fulfill badge requirements. For a list of Forest Resource Education Center programs, visit: www.state.nj.us/dep/parksandforests/forest/special_events.html. To register for programs, visit: www.njforestry.org/mybackyard.